People amaze me. Sometimes in dazzlingly terrible shows of judgement. Just this weekend, I was in Nashville for a business trip and found myself in a country dive bar sipping on a Mich Ultra gleefully witnessing the most atrocious trainwrecks of people mashed together. Stirred by too many rounds of the local game “Holler ‘N Swallower” (insert crude joke about post-bar activities here) and the thrum of an above averagely talented house band galluping across the bar Coyote-Ugly style, they were at their most enthusiastically mortifying. Throw in a few Bump-Its, the thrill of a Thirsty Thursday, and you’ll find the most base levels of mating ritual the world has to offer. Sometimes, though, it’s the solidarity that seems to hold humanity together in the most acute ways that steals my breath. As I sat in the specialist’s office today – two separate times, as it were – I couldn’t help but be moved by the way we were all united. The brief moments of eye contact the women shared. The encouraging, empathetic smiles. The nervous, embarrassed, hopeful glances of the first time patients clutching their new folders emblazoned with images of fat, happy babies, both a symbol of our shared goals and shared trial. The husbands avoided eye contact with others, but watching them reach over and squeeze a knee or land a light kiss of comfort on their partner’s cheek or arm made it feel like we were all on the same team. With already heightened emotions I was touched by the seeming reverence and respect we held for each other through our shared struggle. Sometimes I just need to remind myself that humanity is beautiful. And then there are times I have to forcibly repress the sights and dance moves seared in my brain from that Nashville bar. There are other other days, still, when you just have to screw it all, tip the bottle back, Holler ‘N Swallower and wait for the beer goggles to position themselves firmly on your nose. Yep. Humanity is beautiful. And so is this tart, sweet, green, frozen treat. Peel and slice kiwi. 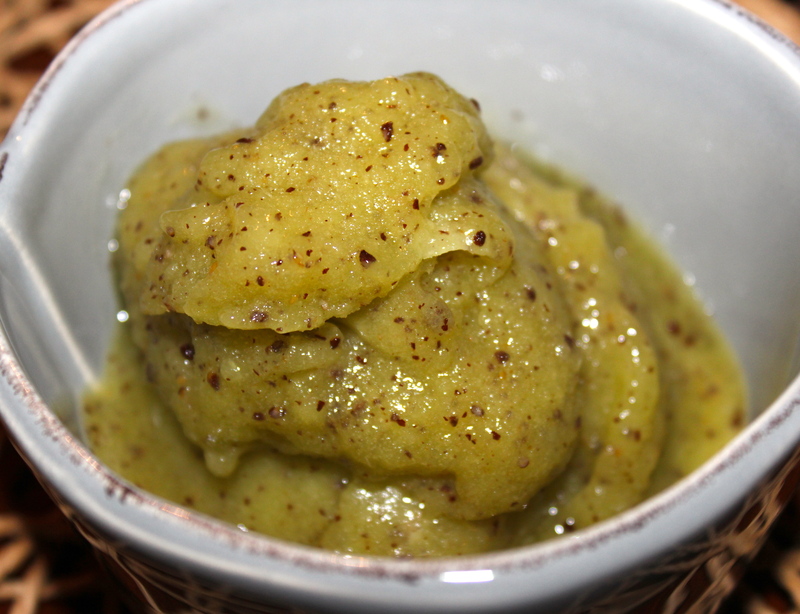 Place sugar, lemon juice and kiwi in a blender. Blend until smooth. Freeze 1-2 hours. Scoop and serve. Keep in freezer in airtight container. For best consistency after an overnight freeze, allow to sit at room temperature 20-30 minutes before serving. Could you use the splenda/sugar mix for slightly lower calories? Yes! You totally could. Splenda can make baked goods crumbly, but since that isn’t an issue with this, Splenda your heart out!